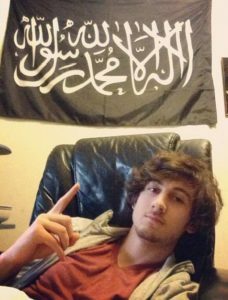 In a show of abject ignorance, many reporters covering the Boston Marathon bombing trial described a simple Muslim flag as a “Jihadi flag,” a statement that shows few reporters covering this case know much about Islam or care to inform their readers. The flag, known as the Black Standard or the Shahada flag, contains the testimony of the Islamic creed, declaring belief in the oneness of God and the acceptance of Mohammed as God’s prophet. To be Muslim, one must accept the Shahada. Admittedly, the flag has been co-opted by Muslim radicals and terrorists since the 1990s, but anyone who flies it or displays it is not necessarily—or even mostly—a Jihadi. Many Muslims have denounced the use of the flag by radicals. As a comparison, the cross was adopted by the Ku Klux Klan during its second reiteration in 1915. Cross burning still occurs to this day and the lighting of these cross are accompanied by Christian prayer and hymns. WhoWhatWhy bets that none of these reporters would consider someone with a cross on their wall a KKK racist, and would simply report it as a religious icon. But they’re still getting the fundamentals wrong. The article goes onto say that an expert is on deck to testify about the flag, but one can’t miss the meaning of the prosecution in using this particular image: ISIS has also co-opted this symbol in an attempt to affirm their ideology that demands the destruction of the Western world. Most Muslims merely use the symbol as reflecting their belief that Allah is the one God. Look for the media to also turn this gesture into one of purely “Jihadi” symbolism without first researching the backstory of its meaning in moderate Islam.